Fortunately, my mom came to visit me this week… unfortunately, the house was a disaster and the kids were nuts so nobody slept. Unfortunately, my son barfed all over the car on an outing… Fortunately, it was only once. Unfortunately, my washing machine broke so we had to take laundry to my dad’s every second day… Fortunately, my mom was super generous and helped us get a new one. Unfortunately, it still won’t be here for another 3 days making it 2 weeks without a washer…Fortunately the weather is so amazing I’m just letting the kids run around naked cutting back on laundry. Fortunately , my stepsister came into town with my niece for a visit…unfortunately, I had to share her so I barely got to see them. It’s unseasonably warm here so I thought it was the perfect time to share an easy dinner that requires almost no cooking and tastes like BBQ mastery, at least in my humble opinion. I’ve made a quick mustard based BBQ sauce that comes together in 15 minutes and makes anything taste good. Combined it with rotisserie chicken and topped with it all with a Cilantro and Lime Coleslaw, making sandwich heaven. The sauce is inspired by traditional Carolina pulled pork. I am in awe of their devotion to tasty meat and the amazing sauces that flow out of that area. I will probably never own a smoker, become a pit boss or devote my life to the BBQ cause but I do want to create my own little version. I’m sure they would roll their hickory smoked eyes at me for my short cuts and use of chicken, but this is a damn tasty sandwich that is maybe a little on the healthier side. I made this while my mom was visiting, she enjoyed every bite and we were divvying up the last delicious mouthfuls. There is a bit of a zing to the sauce so for my son I combined his chicken with a tomato based sauce. He of course ate the mustard sauce proving my extra steps completely unnecessary. I’ve listed both the recipe for the sauce and the coleslaw in this post because they do go so well together but they would be equally delicious on their own. The slaw is tasty, light and makes a great side and the BBQ sauce could make my shoes edible. I have made a recent change to the BBQ sauce recipe. I found that without cooking the onions first the sauce needed more time. Since I want this to be quick I’ve added the step of cooking the onions making the sauce yummier faster. Combine the carrots, cabbage and cilantro in a large bowl. In a separate small bowl mash the avocado getting it as smooth as possible then mix in the remaining ingredients. Toss the dressing and cabbage mixture. Coleslaw to me seems to taste better once it has had a few minutes to mingle with the dressing so I suggest tossing the salad at least 5 minutes before using. For the sandwiches combine 4 cups of hand pulled chicken with the sauce. I used leftover chicken from roasted chicken I made. For a quick dinner a rotisserie chicken would work perfectly here. 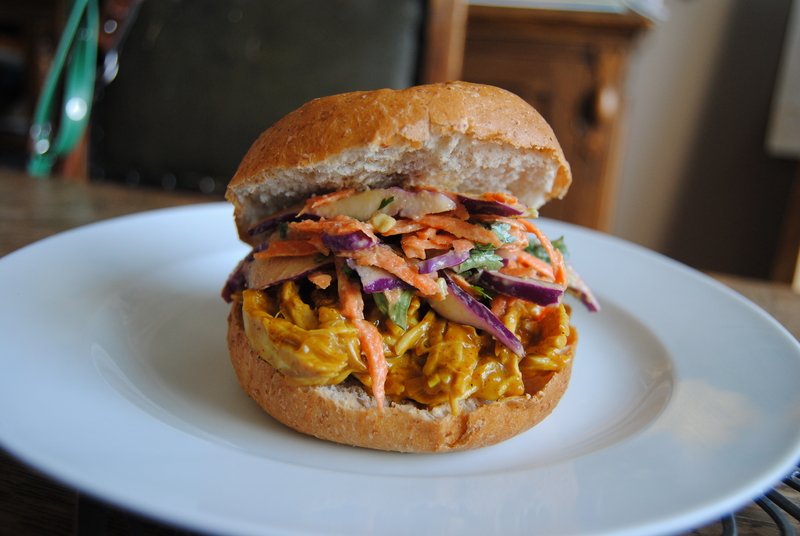 Pile the saucy chicken on your favourite type of bun and top with the coleslaw. Enjoy! !